Most runners tend to be goal setters. Running can be hard (or at least it isn’t always fun). Having a goal to work towards can help keep you motivated and focused when the going gets tough. But not all running goals are created equal. There are some goals (and some categories of goals) that runners just keep setting. They aren’t (always) bad goals exactly, but they are goals that maybe aren’t great, or that could be optimized and made better with just a few little tweaks. To win the race (or to finish in the top 10%, or win your age group). Whether or not you win or place in your age group on race day is largely not under your control. Where you placed in the rankings says more about the other people who also just happened to show up on race day than it says about you. I have finished first in my age group, and last (or nearly last) in my age group with basically the same finish time. Where I placed was determined more by others than by me. Focus on your performance on race day. Know your desired finish time or your desired pace. If that pace happens to also give you an age group victory, so much the better! Race day doesn’t always go according to plan. Weather conditions may present race day challenges, or it just may be one of those days where things just don’t feel right. While setting a goal to PR a course isn’t a bad goal, your goals shouldn’t be set in stone and should respond to the realities of race day. Be willing to adjust goals in the days leading up to (and including) race morning. If everything is going to plan, great! Go ahead a push yourself to a PR. But if internal or external conditions require, be ready to modify that goal on race day. (From a newer runner and first-time marathoner) I’m going to qualify for Boston in my first marathon! Assuming this hypothetical newer runner and first-time marathoner is like the majority of newer runners, this goal isn’t based in reality. There are two basic categories of goal: the audacious and the realistic. Audacious goals are things you want to accomplish at some point in your life. They don’t need to be based in your current reality (be it fitness, budget or calendar realities). They are the kinds of goals that point you in the general direction of where you want to go. For most new runners, qualifying for Boston or completing all of the marathon majors would be an audacious goal. Realistic goals are for the short-term. They are things you can accomplish in the next few months or year. They do need to be based in your current reality. These realistic goals will drive what runs you will be doing in the next weeks and months. Both are important, but it’s important to know which type of goal you are thinking about. Have both audacious and realistic goals, but make sure your realistic goals, are, in fact, realistic. Setting a goal to go from a 5:00 marathon to a BQ in one training cycle? That isn’t healthy (or realistic). You are likely setting yourself up for injury or failure. Audacious goal: Go from a 5:00 marathon to BQ over the next 3-5 years. That’s an audacious goal and is doable with the proper training. Realistic goal: Cut 15 minutes off your marathon time at your next marathon in 6 months. This is a realistic goal that will move you in the direction of ultimately accomplishing your audacious goal. 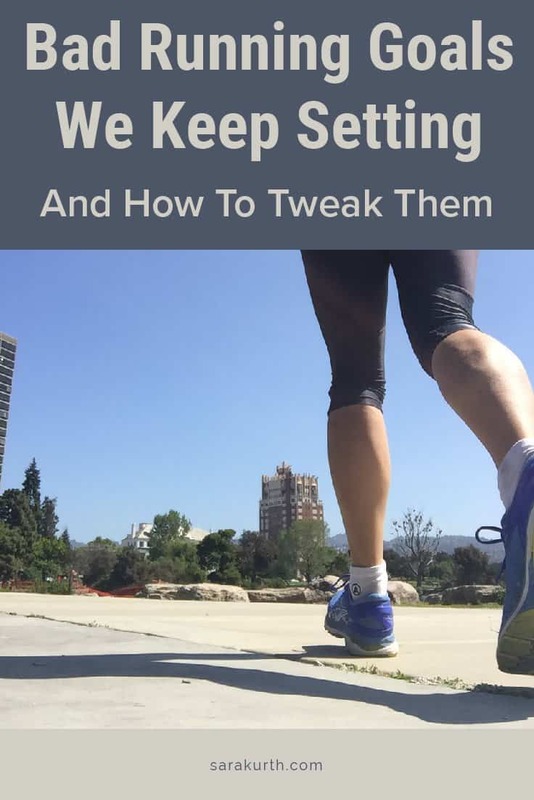 Vague goals are fine for casual runners, and I have (on occasion) written in defense of vague goals, but they aren’t well suited as goals that will propel you forward or to encourage you to get out the door to run. If you are working towards accomplishing a goal, you need to make sure you are setting a goal you can one day accomplish. If you currently run a 5k in 29:00, set your goal to run a 5k in 28:00. If you currently run a mile pace of 9:45, set your goal to run a mile in 9:15. With a specific definition of ‘faster,’ one day you will reach that time. You can then celebrate your success and reset your goal to something even faster. Finishing a marathon (because it’s what you ‘should’ do). Your goals need to be things you really want to accomplish and that are meaningful to you. If your goal really isn’t that important to you, it won’t inspire you or drive you to action, regardless of how well structured or defined your goal is. It doesn’t matter what others say you ‘should’ do or what other runners think is important. Consider why you’ve set the goal you’ve set. Test your goal and your why against what I call the cold, rainy, Saturday test. Imagine yourself in bed on a cold, rainy Saturday and you have a 10 mile (or whatever a long run for you is) run to do. Is your goal, and your why, important enough to you to get you out of bed to do that run? If not, tweak your goal until you hit upon a goal that’s so meaningful and important to you that you just can’t wait to jump out of bed and start working towards it. What about you? Are there any bad running goals that you have made?